Hanukkah games and science activities for preschoolers through second grade. 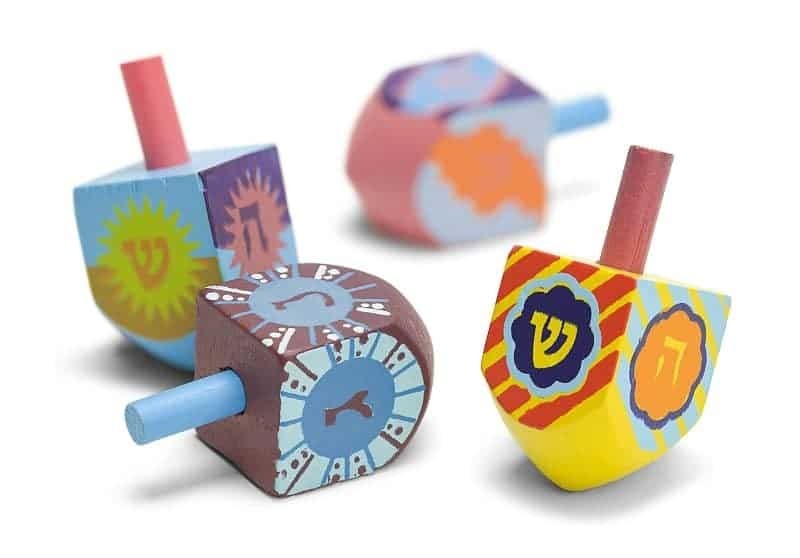 I give the children dreidels of all different shapes and sizes. We count them, and sort them by size and color! Great use of different math skills! I give the children real Hanukkah candles, which we count, and we sort by color. I let the children peel and grate potatoes in bowls placed in the empty sand table. Then they can mix and pour and pretend to cook latkes. This is a process activity which culminates in our serving them already prepared latkes. They really have a good time. For a Hanukkah science idea, we do experiments with light and darkness. One thing we do is make shadow puppets. Using poster board, we cut out dreidle and menorah shapes (you could even do Macabbees) and tape them to popsicle sticks. Then we turn off the lights and close the shades to make it as dark as possible in the classroom. We use flashlights on the wall and see the shadows! We talk about how shadows are formed when light cannot pass through something, and how changing the distance between the light and the shape will make the shadow appear smaller or bigger. Another experiment we do is to show how light travels in a straight line until it hits an object. Take a mirror, a flashlight, and a piece of white paper. Turn off the lights. Shine the flashlight beam at the mirror, and watch how it bounces off and hits the paper at an angle! It’s really cool!